We’d love your help. Let us know what’s wrong with this preview of I Am That by Nisargadatta Maharaj. This collection of the timeless teachings of one of the greatest sages of India, Sri Nisargadatta Maharaj, regarded by many as a "modern spiritual classic" is a testament to the uniqueness of the seer's life and work. I Am That preserves Maharaj's dialogues with the followers who came from around the world seeking his guidance in destroying false identities. The sage's sole This collection of the timeless teachings of one of the greatest sages of India, Sri Nisargadatta Maharaj, regarded by many as a "modern spiritual classic" is a testament to the uniqueness of the seer's life and work. To ask other readers questions about I Am That, please sign up. For some odd reason this book is on my to-read-list. Since I put it there, at some point I had a good reason to do so. However, I'm afraid it will be full of pseudoscientific, religious deepity-garbage. Would a rational atheist get anything useful out of this book? Is it worth my time? Pipilotto It's difficult to guess how you'll perceive it. It will definitely challenge your rational thinking, but it's not about being religious or not…moreIt's difficult to guess how you'll perceive it. It will definitely challenge your rational thinking, but it's not about being religious or not religious. I've read quite many books, and so far it's the best thing I have ever read and practised – I measure that on how it challenges me and what effect it has on me. As a 16 year old, I've come to understand that living a materialistic life is not the way - rather, life should be centered around principles. But I'm still puzzled as to what my life's purpose is - I know there is more to life than just a job. Merely having a job ISN'T life and I feel spiritual emptiness sometimes like there's more to life than what society depicts. Would you recommend I Am That? Too complex for me? I was 18 the first time I bought I AM THAT, but I was 39 before I was able to read it. For this reason, I thought I might give a little advice about how to keep company with this book, a very beautiful and peculiar one, and unlike any other. You will find your own way, as many others have before you. After all, this is the favorite book of many of the strangest people you will ever meet. In fact, there appear to be a significant number of people who do nothing, except read this book, and then acc I was 18 the first time I bought I AM THAT, but I was 39 before I was able to read it. For this reason, I thought I might give a little advice about how to keep company with this book, a very beautiful and peculiar one, and unlike any other. You will find your own way, as many others have before you. After all, this is the favorite book of many of the strangest people you will ever meet. In fact, there appear to be a significant number of people who do nothing, except read this book, and then accost strangers in cafés to tell them about it. If you are new to this way of thinking, and you wish to read I AM THAT, or are struggling to read it now, it would help tremendously to first read a friendly introduction to Advaita Vedanta. Nothing too ethereal, steer clear of the Neo-Advaitins for now, perhaps Arthur Osbourne's Ramana Maharshi and the Path of Self-Knowledge , or any basic text on the life and teachings of Sri Ramana Maharshi. Sri Ramanasramam publishes a great number of useful books. Aim for something rooted in the life of a person, preferably someone long-dead, and not a rarefied philosophical summary. If you seek a living teacher, please be wary. These teachings have been commodified to a degree difficult to believe. Advaita is now big business. Genuine teachers are available, but you'll need your wits about you! Where to begin? I suggest Chapter 48: Awareness is Free. Then turn to the chapters which focus on Sri Nisargadatta's own experience, such as chapters 57 and 78. Then you could turn to chapters which address essential matters in the clearest possible way, such as Chapter 25: Hold on to `I AM', or Chapter 70, renouncing desire, or Chapters 95 and 8 on inner peace and cultivating acceptance. Besides this, I found it very useful to create, among the end pages of the book, a personal index of what I found most useful and most inspiring. A combination of reading and rereading is very well-suited to I AM THAT. At some point in the process, you may find your sense of life and yourself and the world disintegrating. This is normal. Just take it easy, OK? Take long walks and, for goodness sake, keep your mouth shut! Otherwise you'll soon be cornering strangers in cafés. "I read the most mind-blowing amazing book. It's called I AM THAT. All the mysteries of life are in it! I think I might be enlightened. Shouldn't we be sleeping together?" If I had to choose one 'spiritual' book, just one, only one...it would be this one. Nisargadatta points to the 'truth' with such clarity. If I had to pick one book to take to a desert island, I Am That would be it! I've read it numerous times and still find inspiration and guidance from it. The excellent translation by Maurice Frydman makes I Am That eminently readable. It is filled with so many pearls of wisdom that I underlined practically the whole book! I have been reading this book for eight or nine years, picking it up now and then and reading it for a week or two, then taking something else up. I began reading it when my first meditation teacher, Larry Rosenberg, told me (quite casually, when we were in a bookstore) that it was a great book, and great it is. It is a series of dialogues with an Indian man, an ordinary householder, who is enlightened. I don't know what that word means, but I do know that Sri Nisargadatta sees the world much di I have been reading this book for eight or nine years, picking it up now and then and reading it for a week or two, then taking something else up. I began reading it when my first meditation teacher, Larry Rosenberg, told me (quite casually, when we were in a bookstore) that it was a great book, and great it is. It is a series of dialogues with an Indian man, an ordinary householder, who is enlightened. I don't know what that word means, but I do know that Sri Nisargadatta sees the world much diffently than I do. People came to him from all over the world with their questions, their concerns, their complaints, and he responded in most unusual ways. Sometimes I have no idea what he's talking about and sometimes he startles me with his simple good sense. The book is often quite funny, because people are struggling so much, and become quite angry as he tells them they don't have to do that. Having read it through once (it's 550 pages) I will now read it through again; I'll probably be reading it for the rest of my life. It's endlessly interesting and endlessy boring, both. It's indescribable. Recommends it for: anyone who seeks the truth within. You cannot go wrong with this book, though my edition is much older, worn and tattered from travels with me, including India. I had the good fortune to meet Nisargadatta in his home in Mumbai, when it was still Bombay, many years ago and hear him talk. I never will forget his kind presence....he was absolutely present. This book is for every spiritual seeker who wants to stop seeking. Nisargadatta was that rare being who lived as he taught. He was what he taught. Have read several times over the years - each time, it is a different book! Or...am I different? The SATTVA is pure and strong always. It;s its own goal. It manifests spontaneosly and effortlessly, when things are left to themselves, are not interfered with, not shunned, or wanted, or conceptualized, but just experienced in full awarness. Such awarness itself is SATTVA. it does not make use of things and people - it fulfills them." I will be reading and re reading this book over and over for an indefinite period of time. Sri Nisaragadatta is interviewed by a westerner and his answers are as clear as crystal about why people suffer and how we can find peace within ourselves in chaos. Once in a while there is some practical advice for spiritual practice. Usually it involves holding on to the "I am" feeling. This was my second time reading it. It is an excellent and well recommend book for anyone on a spiritual path. I would recommend reading it slow over a long period of time. This collection of practice interviews with Sri Nisargadatta Maharaj never fails to astonish me. Students bring him the most difficult and abstruse philosophical and religious questions, and without fail he answers them clearly and directly, in plain, simple language that is easy to understand. I've rarely encountered any testimony of any spiritual master that was more persuasive on its face of the profound degree of insight and obtainment on the part of its master. Here's an example from one of This collection of practice interviews with Sri Nisargadatta Maharaj never fails to astonish me. Students bring him the most difficult and abstruse philosophical and religious questions, and without fail he answers them clearly and directly, in plain, simple language that is easy to understand. I've rarely encountered any testimony of any spiritual master that was more persuasive on its face of the profound degree of insight and obtainment on the part of its master. Questioner: Is the witness-consciousness permanent or not? Maharaj: It is not permanent. The knower rises and sets with the known. That in which both knower and the known arise and set, is beyond time. The words permanent or eternal do not apply. Q: In sleep there is neither the known, nor the knower. What keeps the body sensitive and receptive? M: Surely you cannot say that the knower was absent. The experience of things and thoughts was not there, that is all. But the absence of experience too is experience. It is like entering a dark room and saying "I see nothing." A man blind from birth knows not what darkness means. Similarly, only the knower knows that he does not know. Sleep is merely a memory. Life goes on. M: It is the change in the living process of a particular body. Integration ends and disintegration sets in. The whole book is a dialogue between a realized master and his student(s). After reading too many books looking for the "ultimate Reality," this is the most clarifying of "It" I have found. My only critique is that he describes our true identity too accurately, and consequently, the ideas can be redundant...there's only so much to say. "The seeker is the sought." Not everyone can read this book. Even after half a century of its publication, perhaps only a handful of people around the globe has reached the state necessary to read this book. I feel like we are a secret brotherhood. Adios amigos, brothers and sisters. A series of q/a with seekers, it remains spiritual whiskey. Not for the timid. Brought me out of an unconscious life into one of discovery. When I tried to read this straight through I quickly found myself losing the importance of what was being discussed. So instead I decided to read a page here and a page there over the course of 5 years. While some of the concepts were too lofty for me to truly appreciate, there was still much in the book that enlightened me. Highly recommended for anyone interested in the idea of spirituality. "I Am That" is a wonderful book. The path to self realization is covered in simple language and ways. Nisargadatta Maharaj's wisdom shines through and with the translation being excellent, the result is almost poetic. He speaks consistently on the direct experience of "I am", getting rid of all misconceptions of the mind. Of the entire narrative, I only felt his answers on personal virtue (smoking, food habits) and action to end suffering were inadequate and inconsistent with the rest of the tea "I Am That" is a wonderful book. The path to self realization is covered in simple language and ways. Nisargadatta Maharaj's wisdom shines through and with the translation being excellent, the result is almost poetic. He speaks consistently on the direct experience of "I am", getting rid of all misconceptions of the mind. Of the entire narrative, I only felt his answers on personal virtue (smoking, food habits) and action to end suffering were inadequate and inconsistent with the rest of the teachings. Nisargadatta Maharaj's teachings are very similar to that of Ramana Maharishi. He exudes respect for Ramana Maharishi and speaks well of all enlightened souls. There are questions which are direct, frank and at time provocative. Nevertheless, Nisargadatta Maharaj replies to all of them with grace and patience. He is extremely humble in his years - placing all at par, the only difference is that others have not yet realized what he has. He does not quote scriptures and sticks to his direct experience. This book is always on my bedside table and is the most important book I have ever read. A complete mindf**k of the best kind. This one really tickled my pineal gland. "It is like entering a dark room. You see nothing - you may touch, but you do not see - no colors, no outlines. The window opens and the room is flooded with light. Colors and shapes come into being. The window is the giver of light, but not the source of it. The sun is the source. Similarly, matter is like the dark room; consciousness - the window - flooding matter with sensations and perceptions, and the supreme is t A complete mindf**k of the best kind. This one really tickled my pineal gland. "Q: How is it (meditation) done? M: You begin by letting thoughts flow and watching them. The very observation slows down the mind until it stops altogether. Once the mind is quite, keep it quite. Don't get bored with peace - be in it, go deeper into it. Q: I have heard of holding on to one thought in order to keep other thoughts away. But how to keep all thoughts away? The very idea is also a thought. "Q: What is the change in consciousness at the moment of death? M: What change do you expect? When the film projection ends, all remains the same as when it started. The state before you were born was also the state after death, if you remember. *Sattva: being, existence, true essence. In yoga the quality of purity or goodness; sattvic - pure, true. I am always reading this. If I feel the urge, I pick it up, turn to a page, and find what I'm looking for. Seriously. For those who wish to gain a truthful insight on the nature of reality. Simply AWESOME!! This book can be understood by reading first few chapters. application of being with oneself. neither about religion or any ritual; it is all about focus on self. This man rejects emotional suppression like 'bramhacharya'. He also shows disagreement with idea of god. if you earn the coin yo This book can be understood by reading first few chapters. if you earn the coin you will get both. "I am" only the witness. and practice observing self,one's deeds of body and mind. -Give up all questions except one, "Who am I?" After all the only fact you are sure of is that you "are". The "I am" is certain, the "I am this" is not. Struggle to find out what you are in reality. -Be content with what you are sure of. And the only thing you can be sure of is "I am". Stay with it and reject everything else. This is Yoga. -Love says: "I am everything". Wisdom says: "I am nothing". Between the two my life flows. -To deal with things, knowledge of things is needed. To deal with people, you need insight, sympathy. To deal with yourself, you need nothing. Be what you are — conscious being — and don't stray away from yourself. The book is a good read for those who like spiritual books. at other occasion he mentions that he eats non-veg and smokes because his body wants these habits. But anyways I liked this book. -A man who claims to know what is good for others, is dangerous. -The man with low intelligence believes, against all evidence, that he is exception and the world own him happiness. I AM THAT is a transcription of question-and-answer dialogues between the Indian yoga teacher Nisargadatta Maharaj and his students and visitors. He believes that the percieved world and mind are illusory manifestations of a non-describable, yet aware, entity. I can see how I construct my own reality as my brain processes the inputs from my sensory organs. However, I think their is a reality from which my perceptions arise. He helpfully challenges my assumption that what I see is "the" reality. I AM THAT is a transcription of question-and-answer dialogues between the Indian yoga teacher Nisargadatta Maharaj and his students and visitors. He believes that the percieved world and mind are illusory manifestations of a non-describable, yet aware, entity. I can see how I construct my own reality as my brain processes the inputs from my sensory organs. However, I think their is a reality from which my perceptions arise. He helpfully challenges my assumption that what I see is "the" reality. We may be manifestations of a different reality that we cannot perceive, but that is an untestable proposition. He believes that the goal of human beings should be to identify with the "I" behind perception, thought, and feelings. That is the doorway to a nonrational experience of the entity that is manifested in but also transcends our known inner and outer worlds. Ekart Tolle takes a similar position in his book, "The Power of Now." I find this to be more helpful on a psychological than theoretical basis. It is very helpful to me, when I am sad, frustrated, or anxious, to be able to say "there is that feeling of sadness, which is not me." "There is that thought about that patient." That detaches me from the thought or feeling enough to process it constructively. I almost gave this book just 3 stars. And it's not a criticism towards Nisargadatta, but the fact that it becomes almost a bore to read the people repeating almost the same questions, and not getting it. At the same time, it's a documentary in the spiritual development of the West. It's like a collections of satsangs, and luckily you can find your question in there, or you can just go to the internet..Still, I found it worth reading. Choose for yourSelf. So the Ideas in this book given by Maharaj really makes sense. .. But almost every chapter is an overdose of ideas and it gets petty monotonous . This is one of those books which should perhaps be read on a quite morning and only in parts ... THe reason why i liked the ideas and concepts here is that it is not governed by religion o religion practices ..
Sri Nisargadatta Maharaj was an Indian spiritual teacher and philosopher of Advaita (Nondualism), and a Guru, belonging to the Navnath Sampradaya. Sri Nisargadatta, with his direct and minimalistic explanation of non-dualism, is considered the most famous teacher of Advaita since Ramana Maharshi. 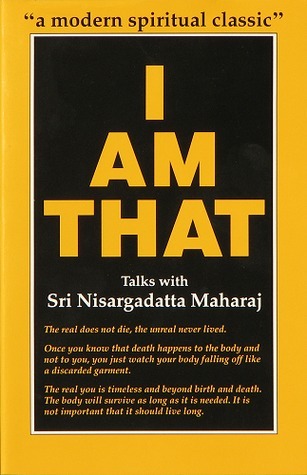 In 1973, the publication of his most famous and widely-translated book, "I AM THAT", an English transl Sri Nisargadatta Maharaj was an Indian spiritual teacher and philosopher of Advaita (Nondualism), and a Guru, belonging to the Navnath Sampradaya. Sri Nisargadatta, with his direct and minimalistic explanation of non-dualism, is considered the most famous teacher of Advaita since Ramana Maharshi. In 1973, the publication of his most famous and widely-translated book, "I AM THAT", an English translation of his talks in Marathi by Maurice Frydman, brought him worldwide recognition and followers. According to Sri Nisargadatta, the purpose of spirituality is to know who you are. His discussions are not for academic scholars. He is a rebellious spirit, abrupt in his style of discussion, provocative, and immensely profound, cutting to the core and wasting little effort on inessentials. His terse but potent sayings are known for their ability to trigger radical shifts from philosophical mind-games to the purity of consciousness, just by hearing or even reading them.